Some people get it right the first time; others are slow learners who take a long time to find what they really, really want in a love relationship. That was the two of us! When we finally found each other in 2006, we each were ready for a deep connection to someone of like mind and heart. Each of us had individually done our work -- processed much of our emotional "stuff" over the years, expanded and extended our spiritual foundations, developed self love and maturity and found authenticity and integrity of self. We also had explored what it was we wanted in a life partner and set our intention for that. Joyce (aka JoySee) lived in rural Mariposa, CA, near Yosemite National Park, a beautiful, pristine area, but not one with a lot of mature, single men. Davie lived about 150 miles away in the Silicon Valley of California in a city top-heavy with men working in the computer field. So each of us used Internet dating services to find potential mates. Joyce found Davie's profile first and cooled her heels for three months before he responded. Somehow, his profile and photo kept her attention during that time even as she deleted other profiles of men who also didn't respond or weren't "right" for her. She knew her perfect mate was on his way to her, and she was sure it was -- as she put it -- "him (Davie) or someone better." In the meantime, Davie was looking for someone as well, and at long last he noticed Joyce's response to his profile. As we began emailing each other, it was apparent to both of us that we had a lot in common, including our writing and communication interests and our spiritual paths. To avoid being disappointed later in the relationship, we asked each other very pointed and frank questions in many areas of life which were answered honestly by both of us before we took the next step of meeting in person. That day finally came -- and walking on the beach at Moss Landing that afternoon in July 2006, we both knew we had something special. We have found that special feeling only getting better since then -- in so many ways. We know we are soul mates, who are here to assist each other to higher consciousness. In addition to enjoying the intimacy, fun, travel and new experiences of being a couple, we both have supported each other with our writing, collaborated on other projects and have attended seminars, conferences and retreats for deeper spiritual understanding of the New Spirituality. This spiritual quest has taken us to India three times for Oneness Blessing training and education and then back home where we give these blessings regularly to individuals. This last time in 2013 we each were awakened. Since then, Davie has been involved in Oneness in many ways, including doing a daily Livestream session (see our Links page). 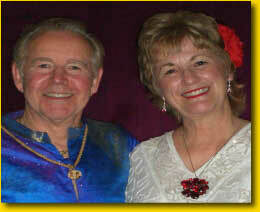 Joyce has supported him in his involvement and also has been delving into A Course in Miracles. Our spiritual paths have also led the two of us to attend Abraham-Hicks events and delve into "Conversations with God" principles. From all of this -- and much more -- we are excited about being of service to others and giving of what we have learned and from our experience. We were married on February 1, 2008 and now live in Campbell, California. Davie has a B.S. degree in Finance from San Jose State University and is a Rosicrucian and an astrologer. Joyce has a interfaith ministerial degree and doctorate in Spiritual Studies from Emerson Theological Institute as well as an M.A. in Communication Studies from Sacramento State University and B.A. from Alverno College, Milwaukee, WI. She also is a handwriting analyst. Between us, we have four grown children from prior marriages, eight grandchildren and one great-granddaughter.